Your backyard is full of construction waste from the refurbishment of your property? So why not benefit from our professional rubbish removal Hammersmith and Fulham W company. Better Cleaning Company offers efficient and inexpensive domestic and commercial, garden and after builders waste disposal together with recycling. Call up 020 3746 3201 or send us an online request for a free viewing for an exact price quote now! Better Cleaning Company is an expert cleaning and junk removal company in Hammersmith and Fulham with a very fine technique to each unique client. We are always devoted to the individual demands and requirements a customer comes to us with. This is why our removal services are always so effective and popular. Arranging removal for you will be entirely performed to your deadlines, wishes and administrative standards. We will pack the baggage for you and we will give you even the packing items. We will find man and van for the transport and will be very attentive for your personal valuables - especially for fine art, valuable items, decorative furniture and hand-made indoor goods. In all cases we acquire not only the packing process, but also the right containers arrangement during the traveling. If you demand personal removal assistance - like tickets, temporarily accommodation or administrative help with the removal, we can help you, as well. We deliver reliable and inexpensive garden waste collection Hammersmith and Fulham W, loading & disposal. Our rubbish collectors are specialised in rapid and proper green waste removal, brown waste removal and waste recycling or dumping. They are going to collect any hedge and grass clippings, leaves, twigs, branches for you and dispose of it in authorized and proper manner. Our hassle-free rubbish collection service is performed by specially educated, trained specialists. They are all vetted and totally insured. 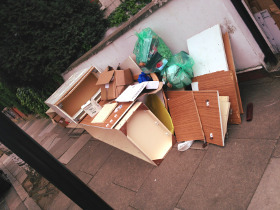 Don`t think twice to ask for an advice or talk about the waste disposal in Hammersmith and Fulham with the operators until they find the ideal alternative for you. It`s their job. Note that the service is first quoted, because neither the price nor the duration is fixed. The junk removal specialists come to analyze the residence – loft, garage, apartment, home, basement, commercial IT or Tyre building, stockroom, etc – to see its size and to check the volume and the type of the rubbish. Then, the price is set and the date for the junk removal is settled. When you agree, the removal operators are ready to respond ASAP! If you consider to use the expert rubbish removal services in Hammersmith and Fulham W provided by Better Cleaning Company, all you have to do is get in touch with our client support by phone 020 3746 3201 or online here. We take requests for free viewings. As a trustworthy rubbish waste carrier we promise you fast arrival of our knowledgeable 2 men teams. Our services are environmentally friendly, and we recycle on your behalf. If you order yet another service, we will make a price cut of up to 15%. Order now!